Below is a photo taken recently at the Magrudy’s bookstore in the NYU Abu Dhabi Downtown Campus: as you can see, they have a stack of new copies of our books for sale! They do look quite nice on display. However, I expect those bookstore copies won’t last long: if you haven’t seen it already, the UAE’s premiere English-language newspaper, The National, this weekend posted a glowing review of Geert Jan van Gelder’s anthology, Classical Arabic Literature. Among other things, the reviewer called the translations “a marvel, and often a tour de force—precise, highly readable and evocative.” A hearty mabrouk (congratulations!) to Geert Jan van Gelder on this very well-deserved praise for what is truly a remarkable feat of translation, covering such a broad array of genres, styles, registers, and subject matter in fluid English. I was pleased to see that the reviewer, Marcel Kurpershoek, highlighted one of our key aims for the Library of Arabic Literature series: namely, to ensure that Arabic’s rich and varied written heritage ceases to be the preserve of scholars and experts outside the Arab world. In other words, by creating a library of these key texts in English, we hope that one day, well-read people, when asked to name their favorite pre-modern Arabic works and writers, will respond with more than just “a vacant stare,” as the review puts it. Keep an eye out on this space, as we’ll be forwarding more reviews and news about the series as they come up! 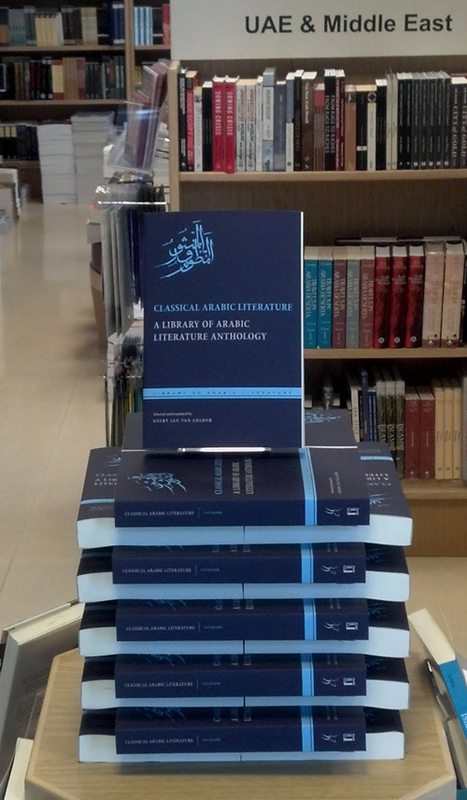 « Our first Library of Arabic Literature titles are out in the world!